Update: USPS slowing down #makerbusiness « Adafruit Industries – Makers, hackers, artists, designers and engineers! 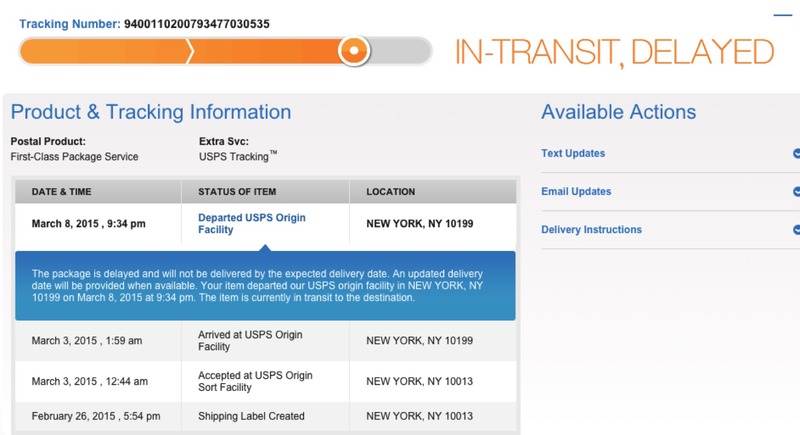 Here’s another one in our ongoing series of postal delays, this package was picked up from Adafruit from USPS on 2/26/2015 (3pm) … USPS did not scan it in to their systems until 5 days later, it then did not leave the USPS facility for another 3 days. It eventually made it to its destination on March 11th, about 13 days later. Update: USPS slowing down – our thoughts on the postal service over the last few months #makerbusiness. USPS slowing down – our thoughts on the postal service over the last few months #makerbusiness. I was one of the folks that pleaded with you folks to keep USPS as a shipping option. But after years of nearly perfect service my local PO has suddenly started rejecting and mis-delivering correctly addressed parcels. It pains me no end to say it, but I was wrong. And I’ve stopped using USPS as a shipping option. You were right. Ineptitude, weather, substitute mail carriers…probably a combination of things. If she is shipping 20,000 packages a month, she is going to have some issues. There is a shift in hiring at the USPS that has been going on for several years- people are given a basic exam, a week of training, and then are thrown in, sometimes with no supervision (as was the case with my PMR or Post Master Replacement position). Some postal routes are many miles long, covering businesses as well as private homes/apartments. In her blog she says the business is located very close to the busiest post office in NYC. I imagine that the volume of mail being processed there is staggering, and if you take into consideration the lack of adequate training for carriers and clerks (who are hired as "temps" in many cases, have no benefit package, no union representation, etc), it’s not surprising that there are issues. That said, she should go directly to the POOM. That person oversees a number of post offices in one region and has more power within the postal service than the local postmaster. The POOM is the post office operations manager. He or she is the manager of the postmasters of each post office in the district. The person filing a complaint can find out who that person is by asking the postmaster at the post office that handles the mail for the company. The POOM will have a secretary- she can start there. There are higher ups, but this would be more reasonable. With that much revenue (20,000 packages per month), I think her company is important to the post office, and she will at least get answers, if nothing else. Hi, I just asked someone who was once a postmaster a few years ago and this was her response . . . If she is shipping 20,000 packages a month, she is going to have some issues. There is a shift in hiring at the USPS that has been going on for several years- people are given a basic exam, a week of training, and then are thrown in, sometimes with no supervision (as was the case with my PMR or Post Master Replacement position). Some postal routes are many miles long, covering businesses as well as private homes/apartments. In her blog she says the business is located very close to the busiest post office in NYC. I imagine that the volume of mail being processed there is staggering, and if you take into consideration the lack of adequate training for carriers and clerks (who are hired as “temps” in many cases, have no benefit package, no union representation, etc), it’s not surprising that there are issues. That said, she should go directly to the POOM. That person oversees a number of post offices in one region and has more power within the postal service than the local postmaster. The POOM is the post office operations manager. He or she is the manager of the postmasters of each post office in the district. The person filing a complaint can find out who that person is by asking the postmaster at the post office that handles the mail for the company. The POOM will have a secretary- she can start there. There are higher ups, but this would be more reasonable. With that much revenue (20,000 plus packages per month is a lot! ), I think her company is important to the post office, and she will at least get answers, if nothing else. I just received a mail order package through the USPS last week and it came a day early. I do not order mail order parts for business, I do for my hobbies. I prefer to have the option to take a risk and pay less for my non-essential purchases. I caught two drivers doing this. One forgot he had a package, the other thought nobody was there. SURPRIZE! But then there is also Sunday service, and I’ve had packages get delivered then by the Post Office that were destined to be delivered on Monday. The thing is, all of these packages? Amazon.